In 2010 the Supporters Trust board were asked to sponsor a project being proposed by the football club’s Community Sports and Education Trust. Following a presentation by Rob Smith, Community Director, the board asked the whole membership to express views as to whether the project would be a good thing. 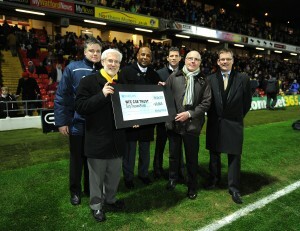 It was decided to proceed and a cheque for £60 000 representing sponsorship of the project for three years was handed over at the match against Portsmouth on New Year’s Day 2011. 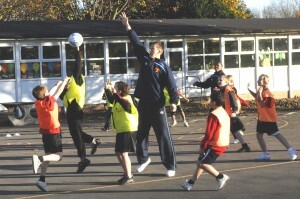 Bringing Education and Sport Together is a health education programme aimed at primary schools. It has already operated in 36 schools covering Watford, Bushey, Rickmansworth, Hemel Hempstead and Borehamwood well on the way to meeting its eventual target of 75 schools by 2013. A first team player is allocated to every school and helps deliver messages about fitness, nutrition, hydration and healthy eating and gives insights into the life of a professional footballer. The project is clearly a success and the benefit to the Trust is that our logo appears on all project materials, our brochure is included in mailings to schools and we have regular opportunities to recruit new members. 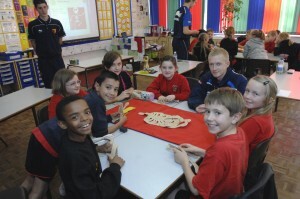 The players enjoy their involvement too.